A few festive favourites from Flickr to take us into the weekend. It's the wee details that set the mood ~ beautiful white paper stars and delicate white crochet; hints of festive red in ribbons for hanging elegant ornaments; cream crochet and textured porcelain add a vintage vibe; twinkling tea lights displayed in softly coloured vintage glass vases. Almost perfect! I'm so, so pleased with this wee lady and I have spent most of today happily admiring her as she sat on my desk holding a few of my festive red pins. And now that I've made one I'm itching to make more, she was so quick and easy to make and would be perfect as a wee 'stocking stuffer' for Christmas. 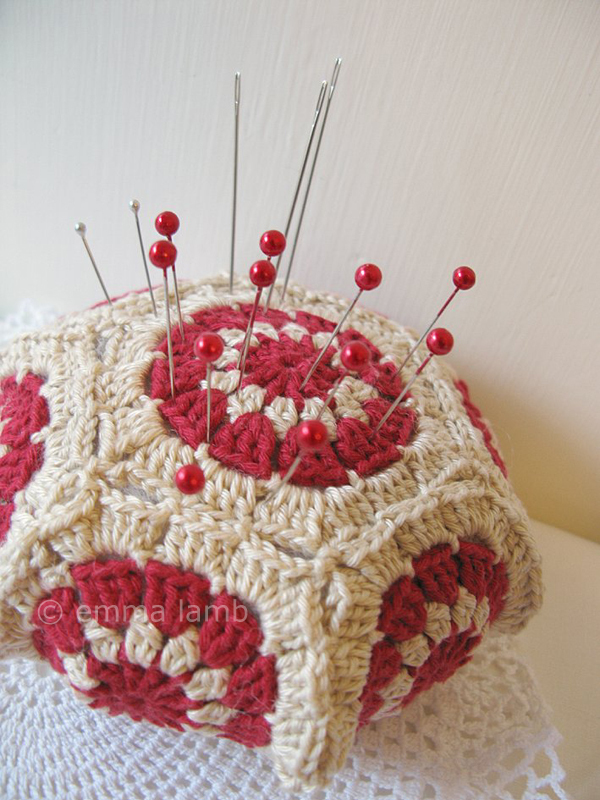 If you're looking for an extra crafty gift to make and give then I highly recommend this wee pincushion. She barely uses any yarn at all and you could easily whip up a couple in an evening, of course one of those will be for yourself! If you missed the link on my last post then the pattern is by the lovely Miss Leanda of One Loop Short. You can buy it on her blog here, or if you have a Ravelry account you can buy it from her pattern page here. i fear my string of miracles has run dry but i'm thinking that perhaps i may push my luck and try one of these 'sweet' things! Ditto to what dottie said! I love that pin cushion. wow ^_^ so beautiful pin cushion! This was a happy project..........very nice! That collage certainly sets the warm, fuzzy mood! 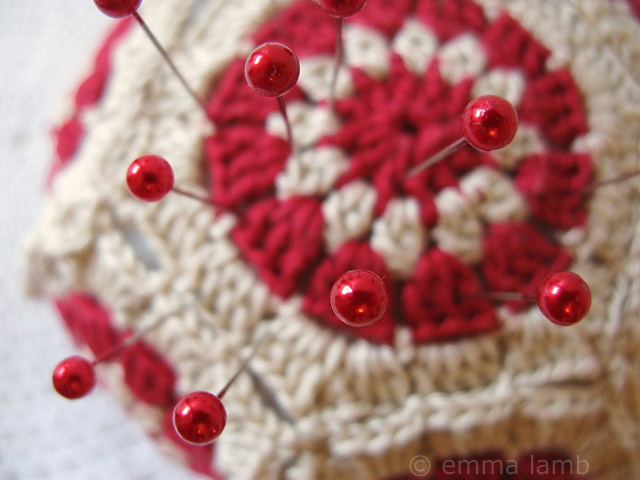 And the dreamy pincushion, so perfect Emma!